Our previous articles were devoted to attracting and retaining tech-savvy Millennial renters who have distinct lifestyle preferences and a demand for amenities and high-end conveniences. Now, we transition to a growing number of seniors that are trading home ownership for rental life. The rent-or-buy dilemma is more commonly associated with Millennials, not people nearing retirement, but this conventional wisdom is being turned on its head. In fact, many downsizing baby boomers are choosing to rent, either out of necessity when they cannot find a suitable place to buy, or because it’s a financially savvy decision. Aside from repair costs, condo fees and other expenses, the allure of flexibility and shorter commutes are driving golden homeowners into the rental market, and the numbers are telling. While a majority of homeowners age 55+ plan to stay in their homes during retirement, according to a 2016 Freddie Mac survey, what about those that plan to move? One in five say they will sell their home and buy another one, yet one in ten intend to sell their home and rent when they move. We note that baby boomers are the wealthiest and one-time largest generation in U.S. history. Given their deep pockets, seniors area a lucrative demographic for Bay Area rental property owners. 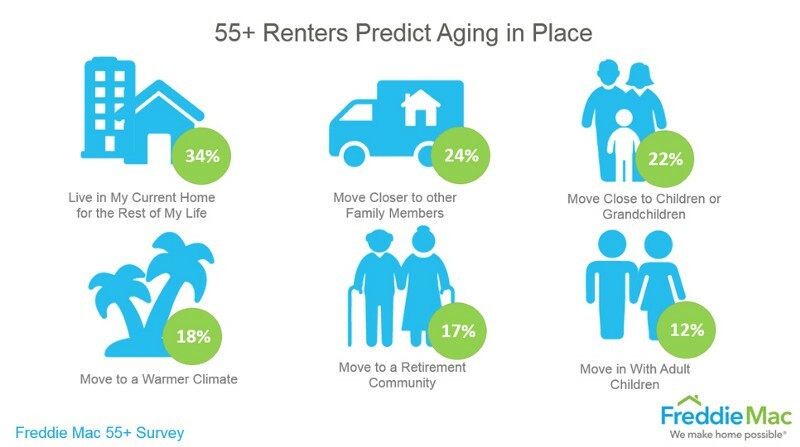 Clearly, the dramatic growth of seniors entering the rental market will require housing and community adaptations. With vaster financial resources at their disposal than younger renters, they can afford higher end units and they expect rental property owners to deliver on that. Seniors have an affinity for single-level floor plans and proximity to transit hubs. They value curb appeal when shopping for their “right-sized” apartment and put a premium on security measures. Spaces for entertainment, recreation and socialization also in demand. Rental property owners should also understand the nuances in how seniors use social media and adjust their marketing efforts accordingly. We will delve deeper on pulling in this age group in future posts — be sure to subscribe to stay in the know. At Bay Property Group, finding the most suitable tenants and maintaining those relationships are among our top priorities and just one skill set we have honed over many years of protecting and enhancing the value of your rental investment in Oakland, San Francisco and throughout the Bay Area. To explore our comprehensive suite of property management services designed to provide landlords a seamless rental experience, get in touch.